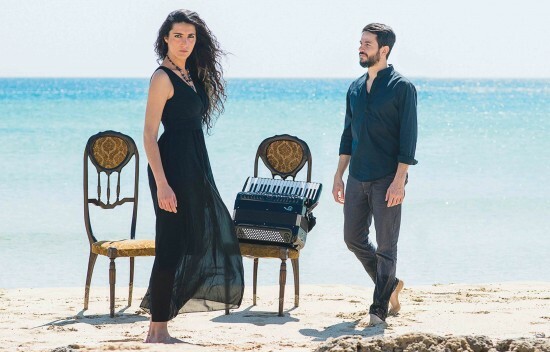 Rachele Andrioli & Rocco Nigro, two young Italian authors and interpreters, propose a new approach by mingling traditional refrains from the Salento region with a personal, more current musical dimension. The voyage begins with traditional music from the south of Italy, crosses the Italian popular repertoire such as Gabriella Ferri, Domenico Modugno, and continues towards the shores of Edith Piaf, Amalia Rodriguez and Chavela Vargas. Rachele delivers warmth and emotion with her powerful voice perfectly accompanied by the agility and virtuosity of Rocco's accordion. The duo released the albums "Maliè" in 2014, "Maldimè" in 2015, and "Maletimepu" in June 2018.